Want to see more of what Maple Syrup Days is all about? The sap will be flowing and we want you to be a part of the fun! Join us for a pancake breakfast and dozens of STEM activities. Scouts, siblings, parents, and grandparents are welcome! Register as a family, a Den, or as an entire Pack. Bag lunches and walk-in registrations are welcome. As winter melts into spring, the sugar bush comes alive at Bear Paw Scout Camp in Mountain, WI. This sweet Scouting program will offer hands on experience in the process of making maple syrup from bucket to bottle. This program is intended for Scouts and Adult Leaders. They should be capable of participating in physical activities and 6th grade science based principles. Sap runs occur when the daytime temperature is above freezing (32°F) and the previous night was below freezing. Full buckets will make everyone happy, but we cannot control the weather, we just hope it cooperates. Dress appropriately for the weather. The program starts on Friday evening with check-in at 7:00 p.m. and concludes on Sunday morning at 10:00 a.m. Participants will learn about the process of making maple syrup from tree to bottle in both modern and traditional methods. During the weekend Scouts will also experience STEM activities which will help them in working towards completing NOVA Awards. The cost of the weekend program is only $50.00 per person and includes all activities, commemorative patch, 8 oz. bottle of Bear Paw Maple Syrup customized with their name, and room and board. 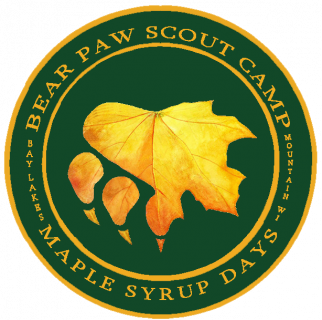 The program starts on Saturday morning with check-in at 8:00 a.m. and a pancake and porkie breakfast featuring real Bear Paw Maple Syrup. Participants will learn about the process of making maple syrup from tree to bottle in both modern and traditional methods. The cost of the of the weekend program is only $20.00 per person and includes breakfast, lunch, commemorative patch and 8 oz. bottle of Bear Paw Maple Syrup customized with their name.